Common Causes of Child Pedestrian Accidents in Florida | DeLoach, Hofstra & Cavonis, P.A. An injury to a child is one of the most devastating events a parent will ever have to endure. Unfortunately, children are more likely to be struck by cars while walking or riding their bicycles than any other age group, and pedestrian injury is a leading cause of pediatric death in the United States. Children are at a high risk of pedestrian injury simply by living in the Sunshine State. Florida consistently ranks as one of the deadliest states for pedestrian accidents, and claims four of the nation’s most dangerous urban areas for pedestrians. Even when these accidents don't result in fatalities, they may still cause physical and mental disabilities that can last for the rest of a child’s life, placing an unfair burden on the child and his family. Walking to school. Children are most likely to be hit while walking to and from school, and even children who ride buses can be struck on their way to the bus stop. One of the easiest ways to minimize danger to young children on their way to school is to have an older child walk with younger children. 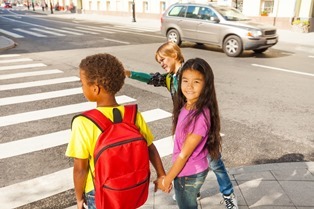 Older children can protect smaller children who may act impulsively or forget to look both ways before crossing. Backover accidents. Children under the age of three are frequently victims of "backover" crashes, which are caused by drivers backing out of driveways. Drivers are often unable to see toddlers out of their vehicle windows and mirrors, especially if there are bushes or fences on either side of the driveway. In these cases, a municipality or construction company may be liable for designing a dangerous roadway. Sudden movements. Children may suddenly run into the street to chase a ball, a runaway dog, or a friend, and not check to make sure the roadway is clear before doing so. Hiding or waiting to cross between two parked cars are frequent causes of these accidents. Visibility problems. “Not seeing” a child is a common excuse used by drivers after an accident. Parents should take all precautions to make a child clearly visible, encouraging them to wear brightly-colored jackets and to travel only in areas where the roads and sidewalks aren't overgrown or obscuring the roads. A child’s clothing shouldn't hamper his ability to see and be seen; even protective gear such as sunglasses and bike helmets should be chosen with visibility in mind. Distracted pedestrians. The news is full of stories about distracted drivers striking pedestrians, but more pedestrians are distracted, too. Children walking while listening to music, talking to friends, or even watching videos on portable devices aren't giving their full attention to the world around them. Children should always be taught to keep their phones or tablets in their bags as they walk or bike to school. Education is the most effective measure in preventing these types of accidents. Not only should parents make every effort to teach their children about how to behave around cars, drivers should also take special care in areas where pedestrians are most likely to come onto the road. If you or someone you love has been involved in a car-pedestrian accident, it's a good idea to seek the advice of an experienced injury attorney. Fill out the form on this page today to make an appointment in our offices.